The verb curse, as already noted, occurred in Old English, but it has no cognates in other Germanic languages and lacks an obvious etymon. The same, of course, holds for the noun curse. The OED keeps saying that the origin of curse is unknown. Indeed, attempts to guess the word’s etymology have not yielded a universally accepted solution. For a long time the oldest dictionary makers tried to derive curse from cross by transposing the sounds in the middle. Such a process (called metathesis) is not only possible but even common, and r is the usual victim of it. The anthologized example is Engl. burn versus German brennen; however, there are dozens of others. Given this reconstruction, we are left wondering how the meaning of curse developed. Since there were so many possibilities to borrow a Latin word or to use a suitable native one to express the idea of cursing, why should the missionaries or clerics have gone to the trouble of mutilating the noun for “cross” and endowed the product with such a meaning? Some people found the link in the verb crucify. But to curse is not the same as to crucify, so that this idea carries little conviction. It is quite possible that curse came to Anglo-Saxon England from abroad. Skeat looked for a Scandinavian source. He referred to Norwegian kors ~ kros, which, as he observed, could mean “plague, trouble, worry.” Swedish korsa and Danish korse “to make the sign of the cross” could, in his opinion, develop into Engl. curse. Kors! in Danish is indeed often used as an imprecation. Thus, curse was said to mean something like “to swear by the cross” or “to ban, drive away, excommunicate by the sign of the cross.” This looks like rather uninspiring guesswork, for Danish kors is a typical oath, like Engl. ’sblood (that is, His blood). An ingenious but unacceptable etymology connected curse with the meaning of the adjective cross “angry” (virtually unknown in the United States but common in British English, as in: “If you don’t behave, I’ll be very cross with you.”). However, this sense of cross is late (recorded only around 1600) and could not be the source of curse. 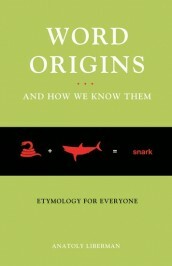 Skeat stuck to his etymology despite the OED’s disagreement with it. In the last (1910) edition of his dictionary, he even added a special paragraph on the alleged Scandinavian source. But, curiously, in his popular A Concise Dictionary…, published at the same time, no mention of Scandinavian is left, and the Old Irish form cúrsaigim “I reprehend” appears (note that ú designates a long vowel). We are invited to “compare” it with curse. Skeat implied that he had found the Irish form in the 1880 dictionary by the distinguished German Celtologist Ernst Windisch. Yet, more likely, he learned about it from Kluge’s 1899 book English Etymology. Curse is said there to be cognate with (!) Old Irish cúrsachaim (sic) ‘I seek’; Kluge added: “Source and history unknown.” At least two modern etymological dictionaries of English cite the Celtic hypothesis without committing themselves. They probably found it in Skeat. Finally, in 1921 Max Förster made a strong case for the English word being a borrowing from Old Irish. I referred to his book-length article on the Celtic influence on the vocabulary of English in the earlier post on curse. This is a very convincing etymology. It appears as though in Middle English the Old Irish verb met Latin cursus and merged with it, so that curse may have had two sources. That is perhaps why the word acquired a short vowel! The rest will sound like an anticlimax. Leo Spitzer (1946) traced curse to the Latin noun incurusus, as in the phrase incursus poenam “the fact of having incurred a penalty.” He had to account for the loss of the prefix in the word incursus and did offer some explanation, but, as was pointed out by one of his critics, the main trouble with this etymology is that the reflexes (continuations) of incursus do not appear with the sense “curse” in any Romance language. Ernst Weekley, like Leo Spitzer, had a profound knowledge of Old French. That is why both of them were always on the lookout for the Romance etymons of English words. Weekley derived curse from Old French coroz, Anglo-French curuz (Modern French courroux “anger, wrath”), whose Latin source is related to Engl. corrupt. In his dictionary, Henry C. Wyld referred to Weekley, but here Spitzer was, I think, right: the word curse turned up in English too early to be a borrowing from French. Finally, there is a Germanic etymology of curse. Its author, Otto Ritter, based his reconstruction on a questionable meaning of an Old English word, and I will refrain from going into detail. In my opinion, the verdict origin unknown should be used only when there is really nothing to be said about a word. In other cases, a summary, however cautious, would be helpful, for example: Curse. [Attested forms] The derivation from cross, though often suggested in the past, cannot be substantiated. Unlikely are also the derivations by L. Spitzer from Latin (in)cursus ‘the fact of having incurred a penalty’ and by E. Weekley from Anglo-French curuz ‘wrath. A Germanic source (Otto Ritter) is even less likely. By contrast, the derivation from Latin cursus ‘a formula for excommunication, etc.’ (The Century Dictionary and Middle English Dictionary), sounds convincing. Rather probably, the Latin formula merged with a borrowing of Old Irish cúrsagad ‘reprimand’ and yielded the modern form, which then is a blend. A curse averted. She will sleep, not die, and Prince Charming will kiss her into womanhood. 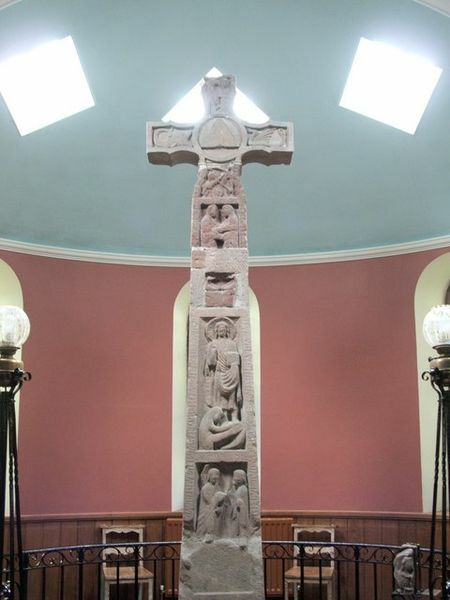 Images: (1) “The Ruthwell Cross” by Lairich Rig, CC BY-SA 2.0 via Wikimedia Commons. 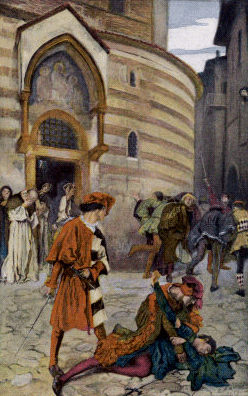 (2) “Death of Mercutio” by Edwin Austin Abbey, Public Domain via Wikimedia Commons. 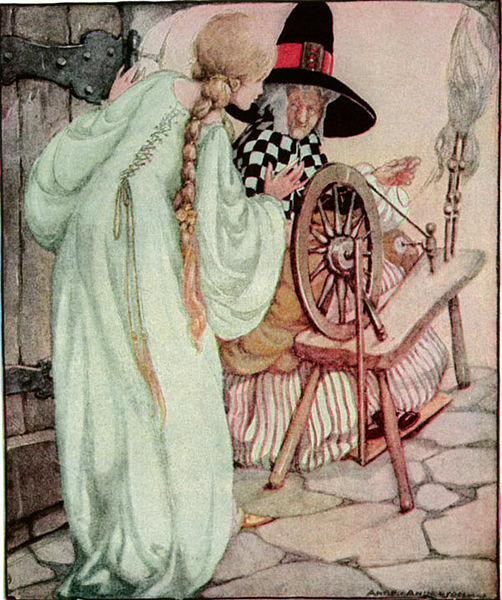 (3) “Briar Rose” by Anne Anderson, Public Domain via Wikimedia Commons. Featured image: “Canterbury Cathedral – Portal Nave Cross-spire” by Hans Musil, CC BY-SA 4.0 via Wikimedia Commons.